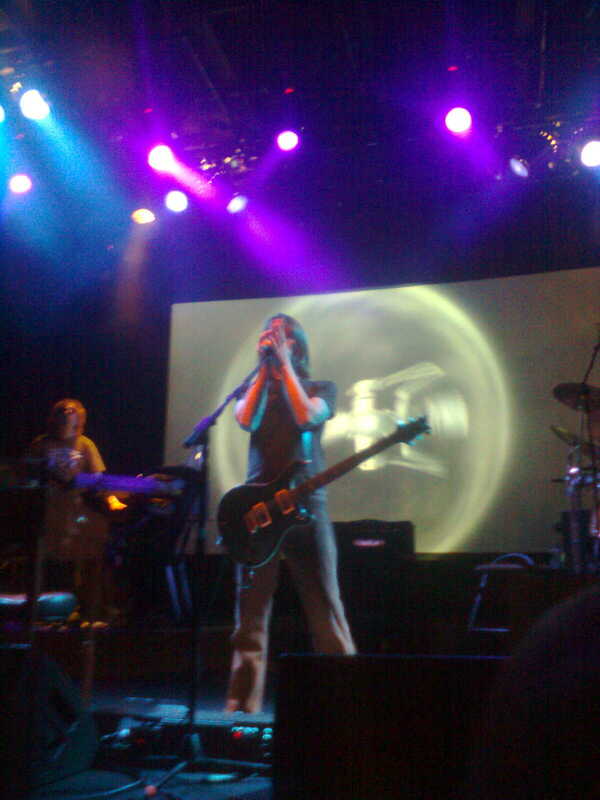 When Porcupine Tree last set foot on Irish shores they played to a venue void of atmosphere, lacking a sizeable crowd, performing essentially to an abyss. But several years on and after one of the most important and meteoric ye ars in their illustrious history, Porcupine Tree have returned valiantly to Ireland as The Incident tour cycle is very near its end. Firstly, support act North Atlantic Oscillation stroll through a short 30 minute set of electronically driven post progressive rock which in parts owes a debt to both Radiohead and The Beach Boys. But tonight is all about one entity and one entity alone. Tripod is blessed with Porcupine Tree’s vast stage set-up including their breathtaking projections and to a rapturous reception, ever the sophisticated and fascinating Steven Wilson enters and the tidal wave riff of ‘Even Less’ collapses in. ‘Open Car’ gets off to a strenuous start with Wilson snapping a guitar string during its intro only to have his back up guitar in the wrong key. “Take 3”, he quips, cheerfully dispelling the blunder and launches into its angular, weaving riffs and, simply put, massive chorus. There’s a focus on newer material from 2002’s In Absentia through to last year’s opus, The Incident. But ‘The Sky Moves Sideways (Phase One)’ makes a hefty appearance throwing the entire proceedings into a psychedelic din that’s never been experienced in Tripod before. ‘I Drive The Hearse’ though flips the air to that of the sombre. Its haunting acoustic led ambience is delivered with flawless execution with Wilson shining vocally and John Wesley hitting the crescendo solo without blemish. In recent shows the set list was actually lacking in material from In Absentia. However here, ‘The Sound Of Muzak’ features surprisingly early and the monolithic chorus of ‘Blackest Eyes’ never sounded so amazing. The visual projections add a whole new dimension to the show, seen earlier with the emotive images accompanying ‘Lazarus’. But with ‘Anesthetize’ and ‘Time Flies’, they take on a life of their own. The former – the haemorrhage-inducing heaviness melded with lithe meandering fretwork and the latter – the vigorous guitar techniques and cascading synths from Richard Barbieri. The concept of both is narrated and accentuated by a visually stunning display. Steven Wilson seems genuinely humbled by the appreciation and adoration shown by all on hand tonight and Gavin Harrison’s grin from behind the kit can be spotted light years away. The whole night is then punctuated by the immaculate, elegant and life affirming ‘Trains’ that brings the curtain call on this long overdue experience.